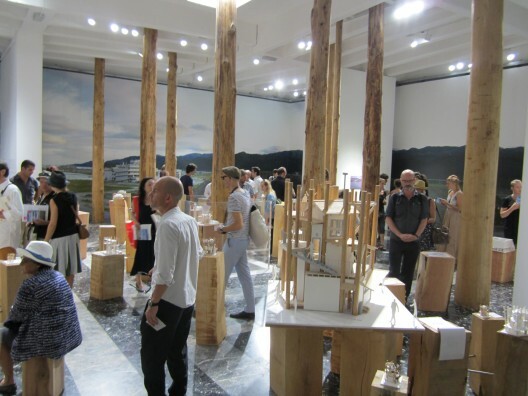 As opposed to what certain critics and commentators have suggested about the opening week, they actually were there, the exhibitors with sociopolitical engagement asking relevant questions, at the 2012 Venice Architecture Biennale opening. What was lacking, however, were outspoken conclusions; the risky and exciting part of taking position after having made interesting observations. Where were the architectural mavericks, the polemical daredevils and provocateurs, to stir up and the debate and bring it further? It was in the Japanese pavilion that questions were asked as well as answered. 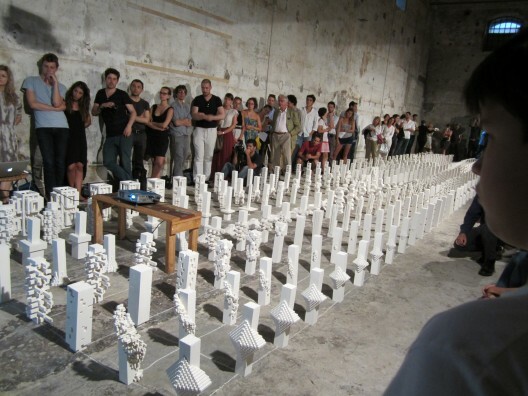 In one of the first pre-events of the Biennale, a surprise storm raged over the Venetian Laguna while in an old warehouse in Giudecca, MVRDV’s Winy Maas and his Delft University department The Why-Factory, put ‘the decline of the identity of The European City’ on the agenda by presenting a new EU City Manifesto. In a whirlwind presentation of ideas and themes that rivaled the storm outside, so much was said that the central idea or statement became blurred. The question and intention were as good and relevant as the presented manifesto was generic, if it even was an answer at all. The event was a premonition of the character of the main Biennale that came to life the next day in the Giardini and the Arsenale in Venice. Gone was the storm, and under a sunny sky the party bubbled through two days of vernissages and openings. Numerous curators turned out to have embraced socio-political themes, most of them as open to interpretation and politically safe as is the overarching Biennale theme of this year: Common Ground. Sustainability, one of the big stories of the last decade, was virtually non-present. Re-marks on big themes were the flavor of this year’s exhibitions. Canada focused on re-housing in the context of migration, Germany on re-use of buildings, Holland on re-setting spaces, Zaha Hadid on re-interpretation of (Frei Otto’s) engineering, OMA on re-appreciating forgotten bureaucrats, Foster on re-grouping more or less all architecture. In themselves the majority of these exhibitions and pavilions were well made and intelligently put together, asking big and relevant questions. In the perspective of the overall event however, the reasonability of it all became unsatisfactory. Common Ground started to trickle through the exhibition, conversations and presentations as a concept that provoked coining numerous politically correct and fair questions, while it steered away from answers. The impression arose that the architectural discourse is scared of looking for answers as these can have a biting political edge and produce risky design concepts. It is shifting towards a facilitating role, in which putting questions on the table is the main task. Such a self-important yet safe attitude can weaken the professional debate in the long run. It is the lack of answers that may have added to Wolf Prix’s irritation, when he wrote a brutal comment on the Biennale earlier this week. A number of curators did take a next step towards explicitly showing their true colors. The Israeli pavilion stunned many by its intense and confronting exhibition: Named Aircraft Carrier (as in ‘’Israel being America’s unsinkable and well positioned largest aircraft carrier’’) it consistently displayed the combination of consumerism and violence that has shaped the current country, and can be seen as context to its architecture. Crimson, in their exhibition called ‘The Banality of Good’ introduced a moral edge, by demonstrating the way one design principle has been applied for entirely different purposes in the development of different generations of postwar new towns across the world, purposes that usually were not met. Eventually though, also these exhibitions left the answers to their sharp questions largely open. It was Japan, with what ended up as this year’s winning pavilion, that presented both a question and answer in their show. Curated by Toyo Ito, the pavilion shows the process in which three young architects developed a community house with and for a tsunami-stricken community in Japan. Sensitive, poetic and practical, the impression left by this exhibition and by the presented community house design is disarmingly unpretentious and optimistic. The overwhelming amount of study models are proof of the ambition and energy that were put into the project by the architects. Displaying a process that oozes both engagement and design pleasure, the pavilion’s message is that (design-)answers do work, even if they are small and maybe vulnerable. Strong architectural engagement needs good questions. It is the subsequent quest for answers in the form of concepts, theories and designs that completes it. Enough stormy questions were asked at this year’s Biennale, but the shortage in answers resembled the sunny opening days: clear and pleasant safety. As a similar statement (and sign of the times? less questions, more answers? ), it make me think of an answer I read this week by artist Bertrand Lavier to a journalist's question in the last Art Press mag: "On a vécu des années avec l'idée que "l'art pose des questions". C'est devenu insupportable à entendre. Ce sont les artistes qui ont des "solutions" plastiques qui m'intéressent. C'est plus excitant de découvrir tant de solutions différentes plutôt que de devoir subir ces sempiternelles questions qui vous plombent". The funny thing being here that Lavier's Wikipedia page states: "his work questions the relationships of art and daily life" etc. But to some extent, I agree with Lavier that we are bored with statements like "my/this work questions this and/or that". It has become a language formula too much used in art and design that certainly doesn't mean that much anymore. According to me, "questioning" had it's (peak) creative time, during the post-modern period around the writings of philosophers like Jacques Derrida (which work I'm a big fan by the way), but now, after decades of questioning, I also have the feeling that we should head toward new answers, for a new era. But answers shoud take into account the decades of questions (to be carricatural: the post-modern period) that came after decades of answers, sometimes wrong, often absolute or idealistic (to be carricatural: the modern period). How to answer in a non absolute way (taking into account diversity, variations, openness, cycles, etc.) and without asking new/additionnal questions? That's a new challenge.